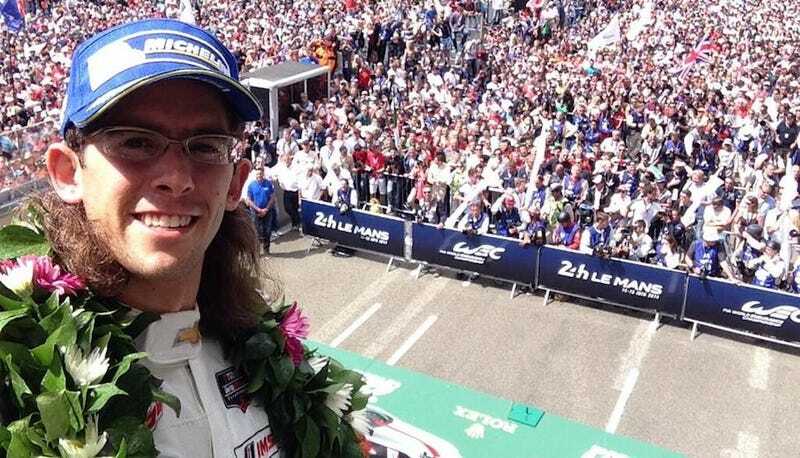 Jordan Taylor, fresh off his podium finish at the 24 Hours Of Le Mans with Corvette Racing is chopping of his splendiferous mullet for charity. While I'm sure everyone will be sad to see that beautiful masterpiece go, at least it's for a noble cause. Who&apos;s Got The Best Haircut In Racing? Taylor, 2013 Grand-Am Champion in the Daytona Prototype class, and hilarious Twitter account possessor, began growing his mullet out in January of 2013 and will cut it off as part of a charity raffle at this year's Watkins Glen 6 Hour. The grand prize winner will receive two paddock passes, tours of Wayne Taylor and Corvette Racing, and a ride around in a Daytona Prototype. They also will get to participate in the ceremonious cutting of the exalted mullet. Godspeed, Jordan Taylor. You (and your mullet) have warmed your way into our hearts.